Update … Since this page was compiled, the project referred to has changed its name to ‘York Stories 2012′. Yesterday the local authority launched their ‘York Stories’ initiative, part of the ‘York 800′ festival. In the real world, as opposed to this virtual one, there’s probably no confusion. But in this virtual world there is. As I expected there would be. I care about this website, and about this virtual world of the web, the integrity and clarity of it, and whether people find what they’re expecting/hoping to find. And it seems a shame that a website which has been a labour of love for 8 years is probably going to lose its search engine rankings because another project, just launched, has chosen the same name. A project which has a massive amount of resources to draw on, and is well-funded. The project is a valuable and interesting one, and clearly the local authority and its many interlinked organisations are best placed to tackle this large task. I’m a little doubtful that any digital archive can be relied upon to be readable in a 100 years time, but assuming it is, it will be interesting to future generations. The only issue is the confusion, in the virtual online world, regarding the name. Perhaps they didn’t think about the clash and confusion. Perhaps they were aware of it, but carried on regardless. It’s not the first time the powers that be in this city have forgotten to even acknowledge the existence of a smaller project. Anyway, I’ll just carry on adding things to this site when I feel inspired and have something to share. I like the creative processes involved. Even after all this time, thirteen years of being online, twelve years of making web pages, the internet’s possibilities still, at times, inspire and delight. Most recently, in contributing to the lovely www.historypin.com. By Lisa @YorkStories • 30 March 2012 Opinions, thoughts, Web/website matters To link to this page's proper location please use the > permalink. I completely agree that the decision to name ‘the other’ site “York Stories” will lead to confusion between the two sites. I can only assume that no research was done into existing sites before the the project was ‘named’, i would have to doubt the competence of the people commissioning this project, the clash in names will also weaken their visibility online after all. i think York Council should be embarassed by their actions, selfishly ignoring the collateral damage they are causing to the visibility of your site online. In my opinion, as a resident of York, i’d rather they spent their time promoting such work as yours. Thanks Mallory, I appreciate your support of this website. It needs support now more than ever, it seems! I’d never expect the council to promote my site in any way – it has managed fine so far as an independent project – but don’t want them to ‘drive me off the road’ either. Still, it’s too late to change things now, so we’ll just have to see what happens. Son of Yorkstories – Looks like another case of joined-up government! Thanks for your support, Graeme and Drake. And thanks to the people who have emailed me. I digress, but that delightful wiki/wookiee digression is an illustration of the wonders offered by this worldwide web, its endless information and quirky delights. My long-established corner of it is something I’ll continue to try to protect. I’ve just been and had a look at that other site. It’s a horrible whirl of bits and pieces flashing all over the place; it’s confused and disorienting. But most of all it’s impersonal. What I really like about the real York Stories is not just the attention to detail that is evident throughout, it’s that you clearly care about it all – and the city – so much. Please keep on speaking up for thoughtfulness in the way you do so well. Thanks Andy, for your thoughtfulness in return, in posting such supportive comments. Some people would find this site visually rather flat and dull, perhaps. I appreciate your kind words – and like your phrase ‘the real York Stories’. In the interests of fairness, I should also mention that in the last few days I have heard from the York 800 York Stories project. Found a horse’s head in my bed. Emails have been exchanged. I’ll let you know when we arrange the ’shoot-out at noon’ in Library Square. Or maybe we could get books from the local interest section of the library and throw them at each other. Though clearly I’d have no chance and would just get pelted with loads of books and possibly knocked out immediately if the big thick RCHME volumes were included. Seriously though. There has been much emphasis on the inclusive nature of the York 800 York Stories project, and they’d like as many people as possible to be involved. They’ll be busy collecting your stories, and I’ll keep adding my own photos and thoughts on local matters to these pages. 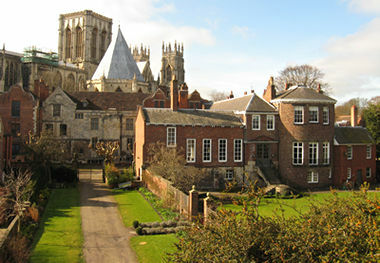 Any thoughts on York you want to send me are welcome here too, as always, in the comment sections or by email.